We are very excited to offer our readers and their families the chance to win our free ticket giveaway to join us at the New York Baby Show, it's the largest baby show ever! The 2017 New York Baby Show, taking place on May 20th and 21st at NYC's Pier 94 will delight families as the largest baby show for new and expectant parents in the country. I was invited by Momtrends to attend a media event at the New York Baby Show for the purpose of facilitating this promotional content. Now in its seventh year, no other baby event provides a better experience for thousands of expectant and new families from New York and surrounding areas, looking to find a family-friendly collaboration of top brands, informative presentations and seminars, exciting giveaways, and lots of information, support, bonding, and excitement focused on families and parenthood. We are hosting a giveaway for tickets for you and your family to experience the show. See below for details. Original ticket prices are $30.00 per family (for 2 adults and up to 4 children), and $20.00 per individual. Through an exclusive partnership with Momtrends and the New York Baby Show, niecyisms and nestlings is able to giveaway 10 free tickets (family or single) to giveaway to our readers. New York Baby Show tickets. We are also offering our readers the opportunity to enjoy an exclusive 50% off discount for the purchase of any tickets (family or single) to the New York Baby Show. Let's connect! 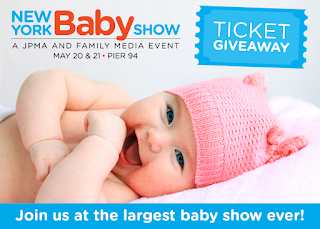 I'm excited to meet our ticket winners at the New York Baby Show! Did you score free tickets? I was invited by Momtrends to attend a media event at the New York Baby Show for the purpose of facilitating this promotional content. As the owner of this blog, niecyisms and nestlings, I am compensated to provide my opinion on products, services, websites and various other topics. This blog may contain affiliate links. Even though, as the writer/owner of this blog receiving compensation for posts or advertisements, I will always give my honest opinions, findings, beliefs or experiences on those topics or products. This blog abides by word of mouth marketing standards. I believe in the honesty of relationship, opinion and identity. The views and opinions expressed on this blog are purely my own. Any product claim, statistic, quote or other representation about a product or service should be verified with the manufacturer, provider or party in question.